Cycling is a transportation bargain for both individuals and government. Compared to the billions for a new bridge or transit line, bike paths are really inexpensive. Still, it is not free. High quality cycling facilities separated from traffic do cost money. 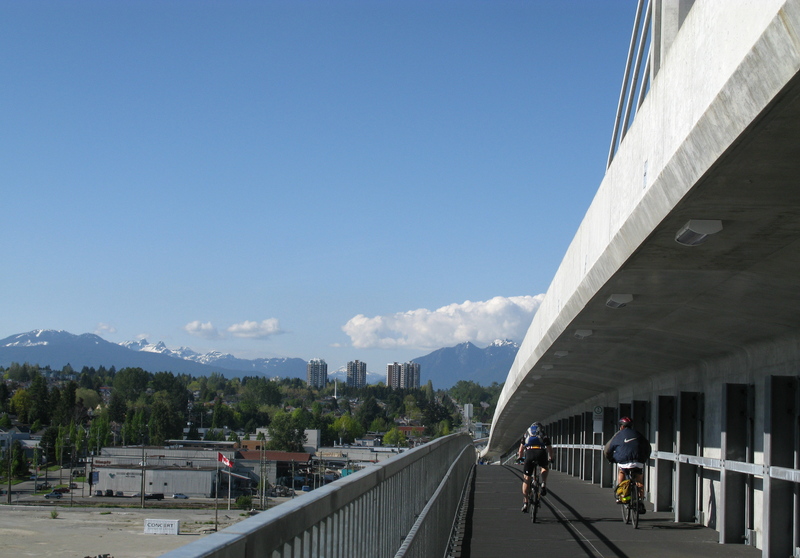 The cycling and walking path on the Canada Line bridge cost $10 million. 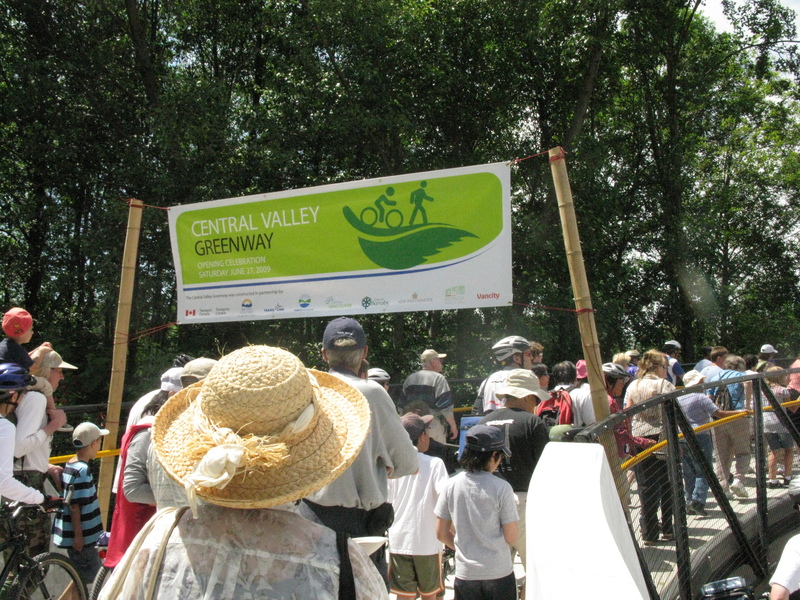 At least $40 million has been invested in the Central Valley Greenway and more is needed for upgrades. The Burrard Cornwall improvements were $6 million. Until people of all ages and abilities can easily travel to anywhere from anywhere on a network of connected bike paths, separated lanes or low traffic streets, the bike routes already built will not be used as well as they could be by residents and tourists. Short sections of bike paths that vanish at busy intersection or don’t connect with major destinations will attract few people. Rough estimates put the cost of creating all ages and abilities networks in communities around the region at nearly $1 billion. A fair amount of money but only third of the cost of Port Mann/Highway 1 Project and the proposed new Massey Crossing. Currently, TransLink’s budget only contains around $2 million per year for cycling. Even when this money is matched by municipalities, it is nowhere near enough to complete the cycling network within our lifetimes. Cycling friendly jurisdictions spend much more on cycling. For example, the Netherlands invests around $40 per person per year or $100 million per year. As many of the benefits of cycling including health care costs savings and cycling tourism accrue to the Federal and Provincial Governments, they should provide matching funding for cycling as well. A regional contribution of around $34 million per year would be reasonable. The good news is that many of the cycling and walking routes to transit stations are also important links in the regional cycling network. The BC Parkway, which needs a lot of work, provides cycling and walking access to many Expo Line stations in Surrey, New Westminster, Burnaby and Vancouver. The badly needed connection along United Blvd will connect Coquitlam and PoCo to Braid Station. Improving these connections should prove to be a great investment for TransLink and the region. By enabling more people to walk and cycle to transit, ridership revenue will increase. And, there will be more space on buses for those who can’t or choose not to cycle. Cycling can ease demand on busy transit routes delaying the need for costly upgrades enabling funding to be used on other transit priorities. For example, improvements to the BC Parkway, Central Valley Greenway and other routes connecting East Van to Downtown could relieve demand on the busiest section of the Expo Line. London is planning on investing billions in cycling to reduce crowding on the Tube. They are even naming the bike routes after the transits lines they parallel. The Mayors Council is currently drafting a regional transportation plan which will likely form the basis of the transportation package in the upcoming referendum. Please email the Mayors Council, mayorscouncil@translink.ca, and your Mayor and Council encouraging them to support more regional funding for cycling and walking networks ($34 million per year) to supported by increased funding for cycling education and promotion ($3 million per year would be great). List improvements that are needed in your area to highlight where the regional funding is needed. A good idea to copy Hon. Todd Stone, Minister.Transportation@gov.bc.ca, Claire.Trevena.MLA@leg.bc. ca, and your MLA (Find your MLA here). More on the BCCC’s funding recommendations to the Provincial Government here. Thanks, Richard. A very welcome, timely and comprehensive input re Vancouver’s regional cycling network! The only thing that might be added is that the base for the entire cycling system is local cycling tracks and networks. Both TransLink and local governments – albeit with funding support from senior governments – need to assure access to a comprehensive regional network in local municipalities.